We got our ingredients ready for all 3 dishes, and then assembled them all quickly at the end so we could eat them all together. While we shared all of the chopping work, we each assembled our own sauce mixtures and then cooked at our own wok stations (so we could then be judged individually by Angsana). When you’re cutting lemongrass, the purple part is where the flavor resides. When there’s no more purple, there’s no more flavor, so stop cutting and throw the rest of the stem away. When making curry paste, use a mortar and pestle to “crush out the flavor” (just chopping it in a food processor isn’t enough). Angsana said that back in the day, men would listen for how loud the sound of the mortar & pestle was. The louder the sound, the better the wife (and more flavorful the food.) From this, we determined that Brad would make the best wife out of all of us. Cover the mortar and pestle with your hand so that you don’t get chili in your eye. This is crucial. Ask Hunter. 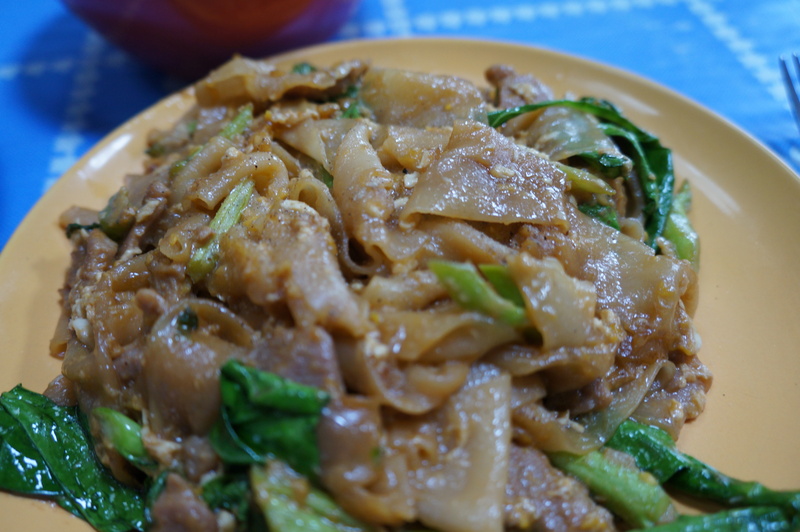 You have to bloom the flavor of the curry paste in just a little bit of coconut milk by cooking it until you see oil on the surface. Then you add the rest of the coconut milk to create more sauce (with the original, now reduced, “base”). If you dump in all of the milk at first, you won’t get that rich curry flavor. And once you’ve added the rest of the coconut milk, you can’t add more curry paste later to make it spicier, because that would defeat the purpose of the entire “blooming” thing you did earlier. To add spice later, you have to just add raw chilies. In America, our Thai curries are creamier and made with more coconut milk. 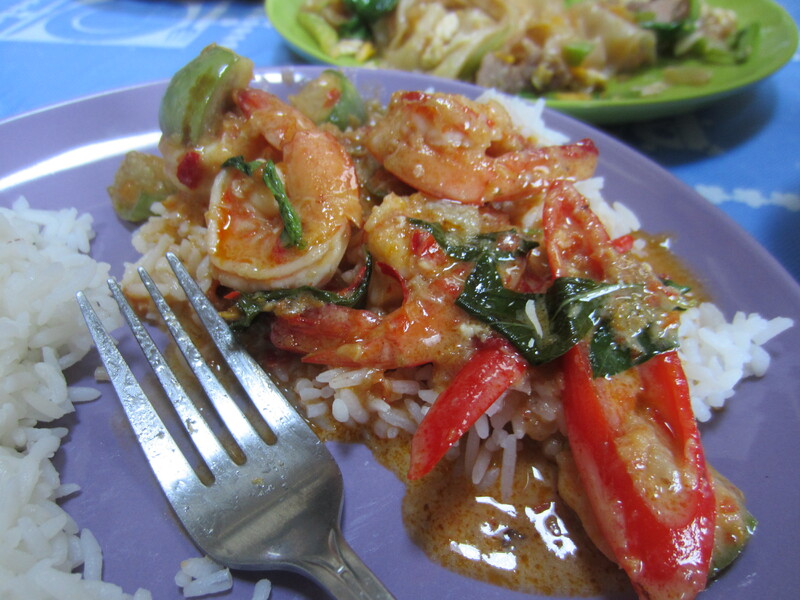 In Thailand, they prefer their curries a little runnier (and spicier), so they use water instead as the thinning agent. Based on this, Angsana voted my curry the best because I chose to make mine the Thai way. When using kale stems, peel the outside of the stem first so that you don’t get that woody texture. When you cut eggplant, have them standby in a bowl of salt water so that they don’t turn brown while you’re getting everything else ready. We used small green Thai eggplants, which were awesome (and you can find these in an international market in the states). If you can find them, the roots of the cilantro herb have a ton of flavor, and is what should be used in the ga-prao gai recipe. I have never seen these in a store before, so now I’m on a new mission. Black steel woks are extremely heat-responsive and easily seasoned, and great for cooking this type of food. I’m buying one immediately. Learn how to measure. Because otherwise you might end up like Brad, with an overly sauced pat see-ew. Green thai chilies are just younger versions of red thai chilies. Green is milder than the red. 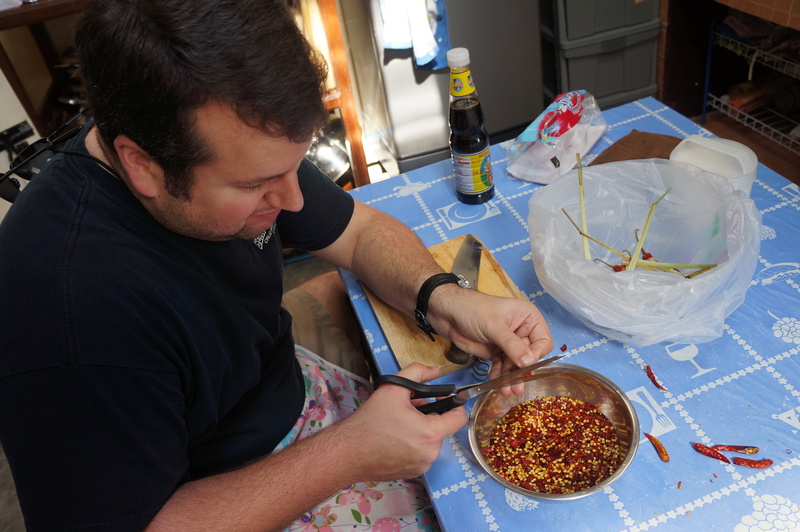 Use scissors to chop up dried red chilies directly into a bowl of hot water, it’s way easier than trying to use a knife. The results? Some of the best food we have ever cooked. 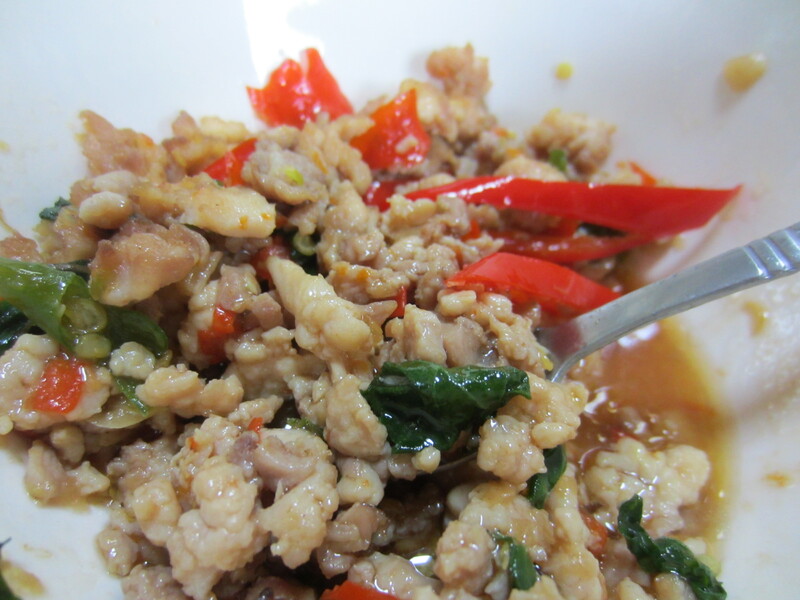 And some of the best food we have had in Thailand yet. Seriously. If you ask nicely, we might invite you to our house for a Thai dinner party where we’ll make all of this food for you and give you the recipes. Bottomline: If you are ever in Bangkok, you must take a class from Angsana. This was one of the highlights of our trip, and our only regret is that we didn’t sign up for two classes! LMAO. Bradley doesn’t measure or follow recipes- something about “understanding the flavors” haha. Kavitha! I’m loving following your adventure!